And they may not be the only ones who were thrown off the boat. You never know. Or at least hope Wiglaf doesn’t notice or he’ll be required to make a detour and save them. At that point Mordred just may hit his own limit and do something drastic. Maybe. If he can pull up the energy to do so. He’s still kinda’ apathetic about the entire thing and he’s in water that’s pretty darn cold. I could see Wiglaf trying to save the whole crew if they had all fallen off. And silly Mordred shouldn’t be complaing about how cold it is. it’s his fault they were on the ship to begin with. Mordred looks kind of funny wet. Now you see, that would be my luck. And if I were Mordred, I’d hit Wiglaf over the head for the jinxing he seems to love doing at the moment. What’s Mordred complaining about? He wanted to ride on a boat. Is he only now discovering its drawbacks? That iceberg marks the latest in a string of bad-luck obstacles for them. How does Wiglaf swim while wearing chainmail? I guess it’s that super strength? Well, not to contradict anyone on the chain mail thing, but alot of divers now adays do actually swim in chain mail to guard aginst shark attacks i dont know if Wiglaf’s would be heavier than that. 1. Divers who are wearing chainmaille are often “walking” divers, not “swimming” divers. 2. “Swimming” divers who wear chainmaille also use a BCD (buoyancy control device– usually in the form of a vest that contains bladders to be filled with air at the diver’s press of a button) that makes room for EXTRA air above and beyond that required to balance out the weights regular divers wear. 3. While divers will wear a steel link maille, their links are both smaller and lighter than the ones in Wiglaf’s shirt, so an entire suit of diver’s maille effectively weighs what his shirt does. That’s not counting the way divers’ maille is sometimes sealed against taking on water, which Wiglaf’s shirt is likely not. 4. Wiglaf is not wearing any sort of BCD, so his buoyancy is EXTREMELY negative, nowhere near the neutral buoyancy divers maintain. –A SCUBA diver who has also worn chainmaille. KGJ, how are you always overflowing with knowledge? But a chain shirt is only a -4 to swim checks. Should I have added something along the lines of *serious face* to that last post? Not at all! :) Just answering for some RPG characters I know well. Lol. Wiglaf should really stop talking. 1. Run into a flock of territorial penguins roosting on the iceberg, who will promptly set to pecking them. 2. Having managed to calve a tiny piece off of the iceberg to get away from the marauding penguins, they will quickly realize the thing is melting and shrinking. 3. Manage to swim from the miniscule remnants of their iceraft either to the Falkland Islands or to contested portions of Tierra del Fuego. 4. Having escaped a land war, they will begin hiking through the Pampas grasslands, Andes mountains (possibly across that massive icefield), and rainforest, wherein they will meet the cousins of their suburban cannibal friends. 5. Finally stagger to the geoglyphs only to find Azrael waiting. Of course, that’s just my prediction based on the current trend. Liliy, I swear if anyone can make things for this pair worse, it’s you. :D I look forward to seeing what you do to them. No, no, you got a detail wrong: 5: Finally stagger to the geoglyphs, only to find Gawain and Hagen cursing about how they can’t find it and in a combative mood from frustration at trying to find it–because Azrael is long gone with the prize. Oh, of course! You are absolutely right. Gawain and Hagen are just following them, so they can not get there first. The boat WAS his idea after all. That might require him getting over that irrational fear of icebergs. 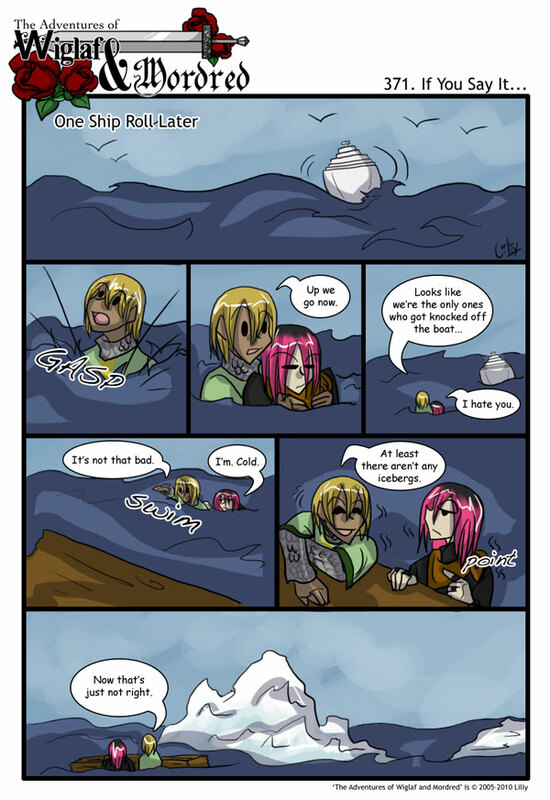 How does he manage to NOT sink while wearing chainmail?